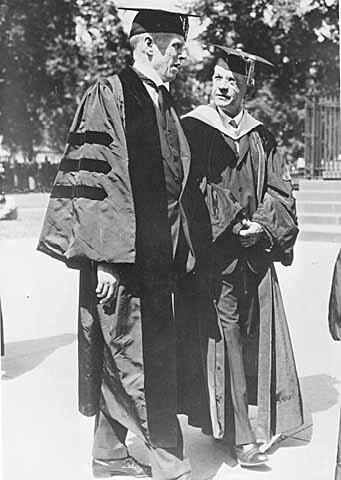 Professor Sinclair Lewis accepting an honorary degree from Yale University (1936). Minnesota Historical Society. On this day in 1885, writer Sinclair Lewis was born. Author of Main Street (1920), Babbitt (1922), and Elmer Gantry (1927), Lewis was the first American to win the Nobel Prize for Literature (1930). So to celebrate his 130th birthday, I’m sharing his writing advice from when he taught briefly at the University of Wisconsin (1940) and University of Minnesota (1942). [Quotes are from Richard Lingeman’s biography, Sinclair Lewis: Rebel from Main Street, 2002]. When you write don’t worry about whether or not it’ll sell …. Don’t want success at twenty-two. If you want fame, be a prize fighter or a movie star. If you write, write because you must write. Because you can’t help it. Write what you believe, what you know, what moves you. And always write the best you can. Be self-proud. You can fool the critics but never yourself. Remember you’re competing with the best that’s ever been written. Try to be better than the best. There’s no limit for you and there can be no writing but great writing. Possess a divine egotism. . . . And never forget that you’re competing with Shakespeare (451). Lewis’ time in Madison was short as, after six classes, he abruptly returned to New York, telling his students, “I’ve taught you all I know. From here on in, all would be repetition” (452). The novelist Robert Penn Warren was on the faculty there, but Lewis was wary of him because he was friendly with the critics Allen Tate and John Peale Bishop, also teaching at the university, whom Lewis felt looked down on him — which they did (468). Presumably Lewis taught his course very similarly to that at Wisconsin, but when the semester ended he left with these last words for his students: “In writing as in life, righteousness is permissible” (469). That’s advice that could be used today. Hi blogger, i must say you have hi quality posts here. Your website can go viral.